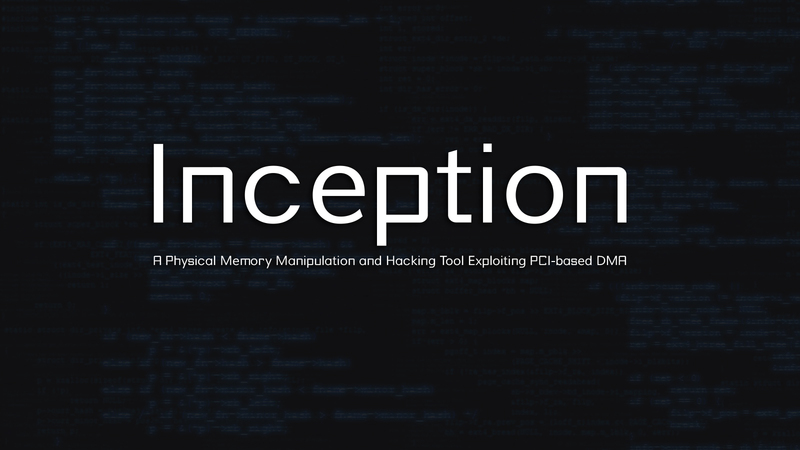 Inception is a physical memory manipulation and hacking tool exploiting PCI-based DMA. The tool can attack over FireWire, Thunderbolt, ExpressCard, PC Card and any other PCI/PCIe HW interfaces. Inception's modules work as follows: By presenting a Serial Bus Protocol 2 (SBP-2) unit directory to the victim machine over an IEEE1394 FireWire interface, the victim operating system thinks that an SBP-2 device has connected to the FireWire port. Since SBP-2 devices utilize Direct Memory Access (DMA) for fast, large bulk data transfers (e.g., FireWire hard drives and digital camcorders), the victim lowers its shields and enables DMA for the device. The tool now has full read/write access to the lower 4GB of RAM on the victim. Once DMA is granted, the tool proceeds to search through available memory pages for signatures at certain offsets in the operating system's code. Once found, the tool manipulates this code. For instance, in the unlock module, the tool short circuits the operating system’s password authentication module that is triggered if an incorrect password is entered. After running that module you should be able to log into the victim machine using any password. An analogy for this operation is planting an idea into the memory of the machine; the idea that every password is correct. Attacker machine: Linux or Mac OS X (host /attacker machine) with a FireWire interface, either through a native FireWire port, an ExpressCard/PCMCIA expansion port or a Thunderbolt to FireWire adapter. Connect the attacker machine (host) and the victim (target) with a FireWire cable. The unlock module can unlock (any password accepted) and escalate privileges to Administrator/root on almost any powered on a machine you have physical access to. The module is primarily attended to do its magic against computers that utilize full disk encryption such as BitLocker, FileVault, TrueCrypt or Pointsec. There are plenty of other (and better) ways to hack a machine that doesn't pack encryption. The unlock module is stable on machines that have 4 GiB of main memory or less. If your the target has more then that, you need to be lucky in order to find the signatures mapped to a physical memory page frame that the tool can reach. Other Linux distributions that use PAM-based authentication may also work using the Ubuntu signatures. The implant module implants a (memory-only) Metasploit payload directly to the volatile memory of the target machine. It integrates with MSF through the msfrpcd daemon that is included in all versions of Metasploit. The current version only work as a proof-of-concept against Windows 7 SP1 x86. No other OSes, versions or architectures are supported, nor is there any guarantee that they will be supported in the future. As an example, to create a reverse TCP meterpreter shell from the target machine to your attacking host, first start the msfrpcd dameon, and then launch a console listening for callbacks. any guarantee that they will be supported in the future.